Coworking Bath is headed by Tom Lewis, the creative brain behind a brand new coworking space in the Guildhall right in the centre of Bath, an ideal location for it and something Bath badly needs to bring together the city’s techies and the creatives. My first full branding project which started off with a rethink of the existing logo. 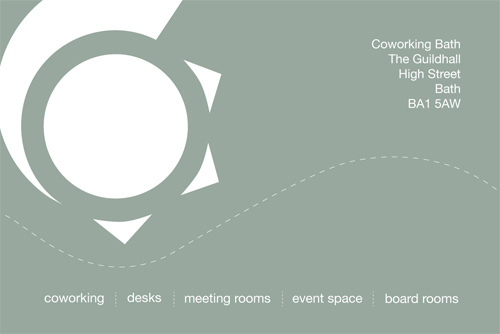 Brought in on the Coworking Bath project in September 2012. 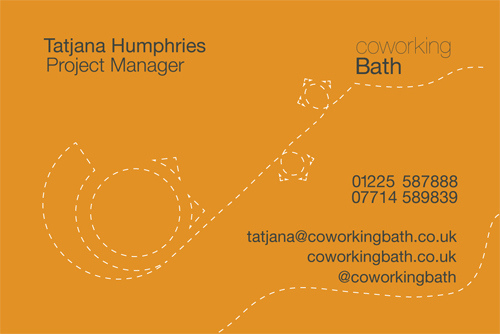 The brief was to create a brand for Bath's only Coworking space opening at The Guildhall in June 2013. There was an existing logo that I drew my final logo concept from. These were created off the back of the existing logo which, to me, represented a round table with chairs. I played with various 'table and chairs' ideas, then after an inspirational meeting with Steve from local design agency, The House, I began expanding my ideas to incorporate the 'swoosh'. This had a couple of meanings, it's almost a 'C' (for Coworking) with the 'table' as the 'O', plus a swoosh said 'wing' 'flight' 'freedom' 'speed', the way it's up on its side gave it an 'incorporating' feel = Coworking. Once we had the logo. It was full steam ahead for the rest of the marketing collateral. We were still working from an almost blank canvas as the Hub hadn't been created physically at the Guildhall yet, so having the logo gave us the direction we needed to move forward. For me, the postcard was the most fun. We all sat around a table throwing out ideas about what 'coworking' meant to each of us and what the Hub would be bringing to Bath. Freelancers who work in coffee shops could come and sit in an environment more suited to working, and the only drawback was you had to make your own coffee. 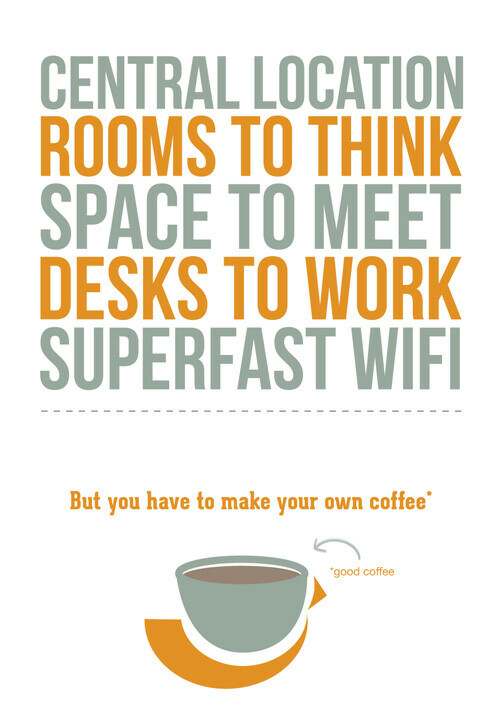 Which obviously wasn't a drawback, because it was good coffee, a better environment, superfast wifi and right in the heart of Bath. The coffee cup I incorporated with the upturned logo to represent the bonus 'good coffee' and that you'll be drinking it within the comfort of an office suited to you. The Guild, as it's now known is fully up and running (as from July 2013). You can also see some photos I took of the place here and my Places - Bath design is hanging up at The Guild for all to see.